This is the first of many Elf pieces. I plan to make the Elf furniture much fancier than the other furniture, so it will take some time. I will post more soon. Elf set is the table and 4 highback chairs. Table is 11/16" tall x 1" round, leg is 3/8"
You can dress it up or down with paint. It comes to you in white. So from High Elf or Wood Elf to the darker side it can be proudly painted to fit your model. Table is 11/16 tall x 1" round, Chairs are 9/16" tall x 1/2" wide x 1/2" to the seat. Elf treasure.... worth fighting for. It is 3/8" tall x 1/4" wide x 1/2" long. First thing you see is the leaf with a keyhole in it. There are any number of reasons to use this Elf bit. Anyway I sculpted this in two seperate pieces then made the mold of the whole thing. The lid shows some depth between it and the box. I can't get it in the pictures, but it looks cool. This bushy vine can add to your WoodElf buildings. Also is handy for a way up a cliff. Here is a poor soul that got too close to Elves. Designed to be used in front of a tree. This is 25mm scale, as is all my pieces. It will come to you in 14 pieces which include 1 ribcage and pelvis with vines,1 skull, the 2 lower arm bones and 2 sets of hand bones,the 2 lower leg bones, the 2 sets of feet bones, the 3 vine limbs, and the 1 sword. Here is an Elf explaining this poor souls crime. A hasslefree miniature helps get the point across. Elf armchair is heavily carved with a warhorse. Any Elf would love this one. 1" tall x 5/8" wide x 7/16" long x 3/8" to seat. 8 piece model. Plus one soft pillow with tassles. For those of you that want a nice front door I made this. It can be dressed up or down with some of my other pieces. Just tell me which Elf race you have when you order. Pictures soon of my other door dressing. It is a keltic knot type thing in 3 pieces. This Elf door has a jewel piece and stone outline. It can open and shut with a little modification. 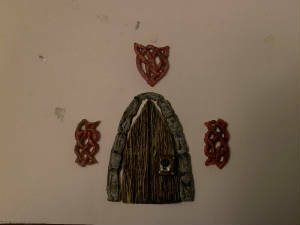 A keltic knot type design for Elves. It can be done in red for the Darker sides of them. 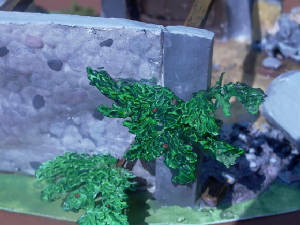 For those of you that may want a Hasslefree miniature check my links page to check out the site. There is a very cool collection, and ordering is like the name says hassle free. Elves ponder & study over a trade for 100 years before they do it, must be nice.